I'm writing to you guys in my new apartment (sort of ), at the eve of my 3rd month since I moved to Melbourne. I know this sounds a bit poetic, but nothing will really change. I will wake up, eat breakfast & reply emails for my freelance work, go to my other job, write, brainstorm shoots, plan shoots, and drink hot chocolate. Just as I have done for the past 3 months. But we can start from all the thing that had happened since 3 months ago. 3 months ago, I arrived Melbourne with 2 big suitcases. I had the biggest plans, and the hope of everything will work out smoothly. It was one the most positive periods of my life. Until I realised how naive I was. I had only one client, but multiple bills to pay. I will be refreshing my emails every hour, and nothing will come up. That's when I found out what I was lacking - a local portfolio. I started reaching out to people, pitching brands & other creatives if they'd like to work together, that's how Dusk to Dawn happened. Now I have a brilliant team of girls (and boys! ), that are so good at their craft, and I always refer back to them when I need to do a shoot. This editorial will be published on an independent magazine from LA. I can't say much yet, but will definitely let you guys know when the issue is released later this August. I'm also currently just showcasing volume 1 of the shoot, 2 & 3 will be live really soon! I started a new job a while go. I have been freelancing my whole life, and despite all the creative projects, I still have zero experience when it comes to the business side. Being a freelancer means you're running your own business, which is why I wanted a marketing job at the first place. The funny thing about this position is that, I wasn't the kind of person they were originally looking for, they wanted someone with at least 3 years in the fashion marketing field. But I love the role so much and just asked anyway. I think my boss found it interesting so she interviewed me. I was honest right of the bat, telling her I know I'm far from what you're looking for, but I'm willing to learn, and listed out what I can bring in to the her business. The first two weeks was hard, I will be sitting at the studio (it's a clothing brand I'm working in), figuring out all the backend and admin stuff till 12am. I know 2 months doesn't seem long at all, but when you were originally only meant to be there once a week, and now they ask you to be there 4 days (aka everyday, the studio doesn't run on a Friday). You're doing something right. My advice to those of you who wants to get recognized in the work field? Grin it, bear it, ask questions and put in 150%. It's tiring, but worth it. If I'm honest, I'm not satisfied with my apartment yet. 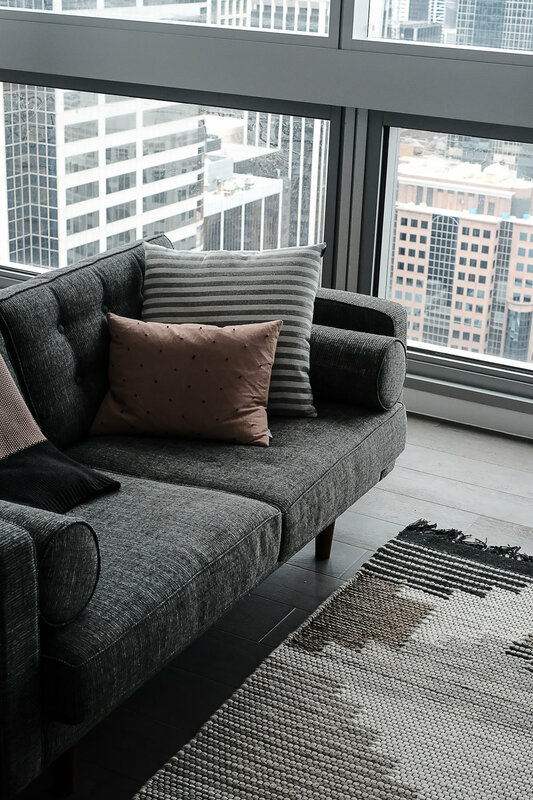 I'm waiting for a few decor piece & prints to arrive, and I'm also still looking for a coffee table I like. Some of you might have seen sneak peek of the place when I first moved in, which was a lot different then it looks right now, Anyways, I went for something a bit feminine this time, brought in a lot of warm colour and dusty pink. I'm loving the change of scene. It's nice, don't you think? I'm using the lounge area as a home office, living and dining room. I also have another room as my photo studio, filled with props, mood board, and lighting equipments, that's where most of the product flay-lays happen (let me know if guys like me to do a studio tour). There will be full post about the whole decorating process, so I'm not gonna spill too much about it today. I've got an excited project happening in Tokyo later this year, so I suppose there's no better time to pick up where I left of with Japanese again. I had learn it a few years ago during one particular summer holiday, and that's probably it. I recently enrolled in a 3 months course, it's pretty intense, but it feels good to learn another language again. 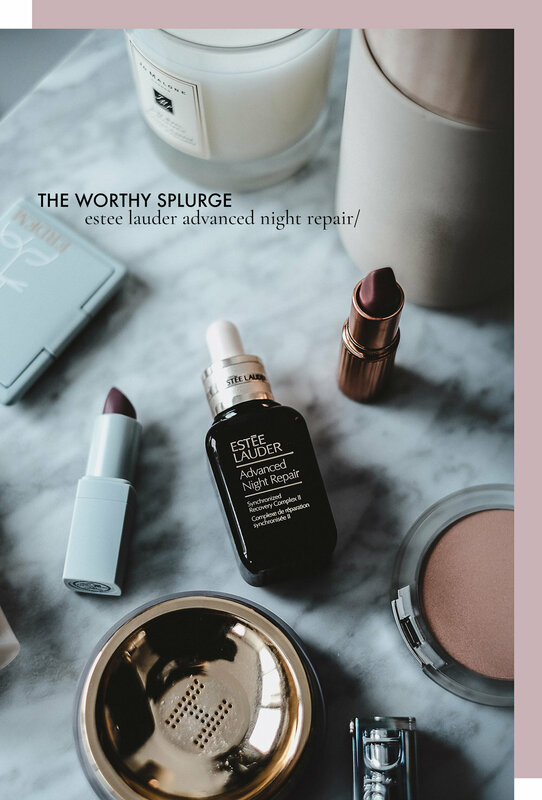 I am CRAZY about the Estēe Lauder Advanced Night Repair. I've heard so much about this product for years, but since I have sensitive skin, I was a bit hesitant. Until I got to try a sample for 2 weeks, and honestly I have never been so amazed by a serum. My redness was better, skin looks plumper, and even the dullness from late night sleeps were less obvious. Surprise surprise, I now own a full bottle. and let's end it with make up.. In order of application, let's start with Armani Luminous Silk foundation. A medium coverage base but extremely natural. I'm light-handed when it comes to make up, so my finish is sheer and silky, but you can always build it up. Not cakey, and skin looks like skin. I've had struggles with setting powders for so long since my skin is pretty dry. For those of you with the similar problem, I would recommend trying the new Hour Glass Veil Setting Powder. It sets your make up without leaving a white cast, doesn't dry out, and even comes with a bit of glow. Speaking of glow, the Clinique uplighting Illuminating Powder is my current highlight go-to. If you've been following me for a while, you know beauty & skincare is my weakness. I feel like it was after uni that I had made the transition not only to start looking into makeup but also really spend the time to take care of skin. I'm also really lucky to receive products from companies to test and try out. All that said, since I haven't written any favourites articles for a while, I thought it would be nice to make a list of some discoveries from the past three months. I must admit, I have only started using this foundation for three weeks, but man, I'm hooked. I love the mousse texture along with the semi-matte look. It's one of the most natural matte foundations I've come by. It's so lightweight, and yet it covers just enough for a comfortable everyday look. I remember right after the two days of wearing it, I can't help to recommend it to my girlfriends. I use to complain not being able to find the perfect Armani foundation for me (I mean who doesn't want Georgio Armani on our vanity, right? ), and the search is finally over. Perricone MD has been releasing a range of No Makeup Makeup products for a while. It's a series of product with skincare in mind while providing the bare face illusion ⏤ the 'I woke up like this' look. And my pick of the bunch will be the No Highlighter Highlighter. I wear this all time, even when I have no foundation one, it gives you that natural baby skin look, which I personally really love. However, if you're looking for something with the greatest lighting strobe, this may not be your taste. At the end of last year, I had the most serious skin allergic reaction. It was really confusing since I had cut off seafood from my diet ages ago. After seeing the dermatologist, he told me it was something I applied. So I spent the time to look into my skincare/ makeup products and decluttered my vanity. And the Restorative Day & Night Cream was the only moisturiser I kept. 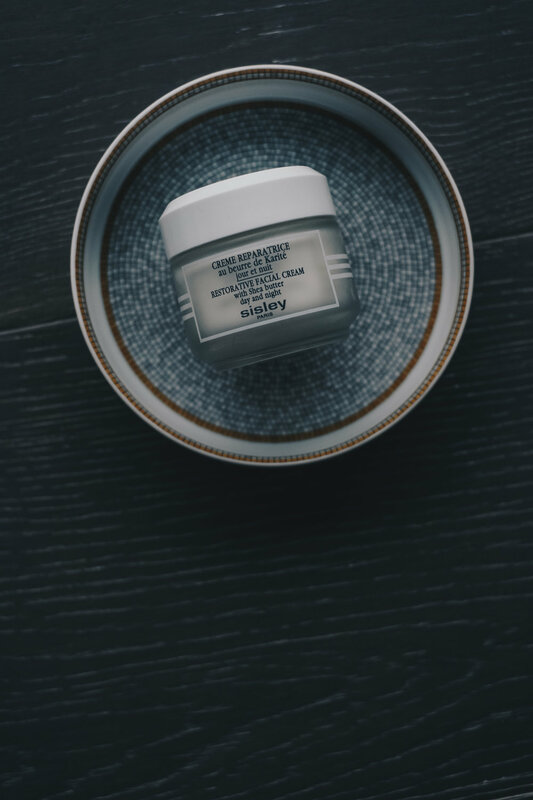 It's incredibly moisturising, and yet still really gentle on the skin and not only I had fully recovered, but it also made my skin texture better. I'm currently in my third jar, so you know how much I love it! Another one of my post-allergic survival kit. I bought this Fancl cleansing gel during my last trip to Tokyo. It says mild, gentle & good for sensitive skin on the packaging which I figured will be perfect for me. Fancl is a Japanese brand known for using the most natural ingredients and still delivers the best face forward. Finally, I get to remove makeup without stinging or irritation. I'm not a big fan of full-on, volumised mascara. I love to have them thin, natural, semi feather-like. So I'm sure you can imagine when I discovered the Feather Noir Ultra-skinny Lash Discovering Mascara. It gives that "your lash, but better" look, my lashes look longer but not too much. I've been using it almost every day for the past 3 months, that's how much I love it! All my friends know I'm a sucker for glossier products. I love their minimal packaging. The beauty balm is an all-time favourite, and now I can say the Body Hero Daily Oil Washis one too. I was once told a proper moisturisation starts in the shower, and now I finally get it!